With all the discussion of the Produce Traceability Initiative and increasing importance of food safety, ArmgaSys wanted to develop a user-friendly application that can be utilized by anyone, even those without computer experience. This touch screen application will allow virtually any warehouse employee to simply select a product from the touch screen when they see the product coming down the packing line. This triggers a case label to print. 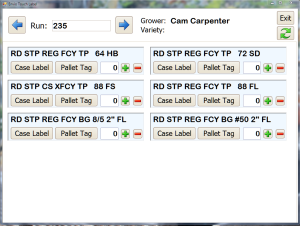 Once all the case labels have been printed for a pallet, there is another touch button to print the pallet tag. All of these steps are done without the use of a keyboard or mouse! This application satisfies GTIN traceability with the touch of a screen! Our Wireless Handheld Modules integrate seamlessly with your EnvioAg Produce Software with five different modules designed to increase efficiency and provide the most real-time information throughout an organization. Ship Tags: Allows warehouse employees to scan tags as they are being loaded on to the truck to provide real-time inventory information at the time of scan. After the tags are scanned, the order is immediately promoted to Shipped status. Dump Tags: Provides the ability to scan pallet tags as they are being “dumped” into a Production Packout Run. This process provides information as product is being dumped into the packing line. Move Tags: Scan pallet tags and select a new storage location from a drop down list or scan a bar coded Location Code when moving pallets to another Location. Move Bins: This module will allow the ability to scan the Serial Numbered Bins when they are moved to another Location. Receive Bins: This Module increases efficiency in the receiving area and reduces truck wait time by allowing employees to scan Serial Numbered Containers (bins) when product is received from the field/orchard.